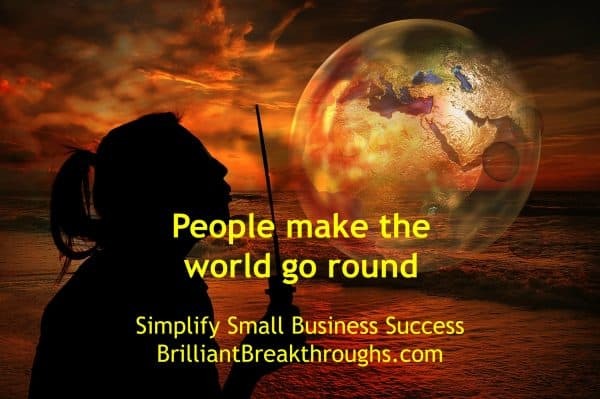 People, not money, makes the world go around - Brilliant Breakthroughs, Inc.
People are what makes the world go around for Small Business Owners. Too often I hear the saying that “money makes the world go around”. This is erroneous thinking! People are what makes the world go around and your business tick. The short answer is very simple: People control money. Thus, only people can redistribute money to you and your business. You and your business need money to survive and thrive, right? Sure, every business must incur expenses which need to be paid. Then, wouldn’t it make sense for you to build stronger relationships with more people? Yet, this is the one thing that I see most Small Business Owners (SBOs) not do. We can throw in the towel on SBOs doing this consistently – it just doesn’t happen. There’s a number of reasons why SBOs aren’t creating and fostering business relationships. Perhaps it’s lack of understanding this as a process and/or it’s necessity. It may even be that some SBOs are afraid – lacking confidence to go introduce themselves to others. It could be that some SBOs were given bad advise about 10 years ago when social media came on the scene like I was! I was told, be VERY selective about who is in your (social media) networks. This was bad advise and I believed it because it made sense – much like how we segment email lists now. I know I’m not alone! What’s better advise? Build your networks (in person and online) with intention. CAUTION: Be selective and make sure there’s a good reason or purpose as to who you accept. You don’t need to be hyper-vigilant about this. Over time your network will work itself out or you can annually edit it. 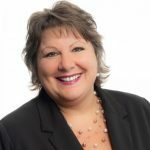 Let’s see if we can help you gain clarity as to the 5 types of people you need to have ongoing relationships with to grow your business. ~The above is an excerpt from Chapter 1 of Brilliant Breakthroughs for the Small Business Owner (Vol. 1). What’s next to help YOUR Business World go around? It would benefit SBOs to see their business as its own world and treat it as such. If SBOs did this, they would have a thriving business instead of one that is in need of life support. It takes each role to effectively support your business. When you understand that money makes the world go around (AKA: YOUR Business), you’ll be taking good care of YOUR Business’s Performance and Growth. Since each role has a different focus and purpose in your business, over the next 5 posts we are going to discover the importance of each role and why you should begin nurturing these valuable players into your business’s regular activities of strategies and tactics. Which role is needing the most to support you finishing this year on a strong note? What can you do right now to secure a relationship that will benefit your business? Feel free to share your plans here in the comment section.